As I excitedly celebrate our first football victory of the year (Michigan 59, Central 9), I'm happy to report that I had a lot of thoughts about teamwork and how it relates to 'real life' while I was watching the game. In between the hooting, hollering, and yelling. And snackies. I LOVE football snackies. I watched the Wolverines work together this year. It wasn't, as the past few years, a show all about one person, or a team that relied too heavily on one aspect. A good team knows they need each other to do the job properly. There isn't a position that's more important than another. One might be used more often, but if the others are not also in play, nothing will get accomplished. If there is no one to block, you don't have a win. 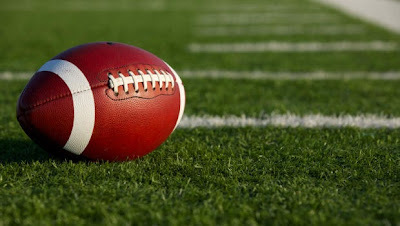 If there is no quarterback to throw or run, you don't have a win. If there is no one to receive a pass that's been thrown, you don't have a win. In the same vein, you might think the people on the sidelines or those behind the scenes are less important, but they all have their calling as well. Cheerleaders are a source of encouragement, rallying the spectators regardless of how it appears the team is doing as a whole. Spectators cheer for their team, make noise to distract the opposing team, celebrate victories, and commiserate in their losses. The band brings everyone together with music, some new and some old, some traditional and some cutting-edge. They play instruments and march and dance, always joyful and supportive. There are offensive and defensive coordinators, assistants, people to help with water or Gatorade, the ones that move the chains, the refs, and so many more that help to make the game possible. The coach is obviously the most integral part of the entire entity of football. With no coach, the team will fight amongst themselves to appoint leaders, bringing nothing but misery and negativity, ensuring that proper teamwork will not occur and, therefore, no wins, either. With a poor coach, the team cannot reach its potential. With a mean coach, the team, regardless of wins or losses, is made to feel beaten down and discouraged. However, with a caring, driven, passionate, and COMpassionate coach -- one who is knowledgeable about the game, has a proven record of past wins, who takes the players' individual personalities and abilities into consideration, who has a master plan and knows what it takes to achieve the desired outcome, and who demonstrates strength and commands respect without demeaning the players -- every member of the team will be both fruitful and joyful, and the team will most definitely be victorious. It seems the same is true for the followers of Jesus. Some of us are good at working with people one-on-one. Some can sing, some can quote scripture and find the perfect verse to comfort someone in need, some can perform skits to bring realities to light, some can bring healing words, some can pray, some can stand on the sidelines and cheer and encourage. Some can write, some can speak, some can listen. Some can lead praise and worship, play guitar or piano, teach our children, serve soup to homeless people, teach job skills, volunteer to make sandwiches for hungry kids on the weekends when they don't get a free meal at school. If every one of us uses the gifts and talents we've been given, the team is a well-oiled machine and the goal can be accomplished. Best of all, we have the greatest coach in the world -- driven, caring, passionate, and COMpassionate. He is most definitely knowledgeable about the game of life, has a proven record of past wins (just read the bible! ), He takes his followers' individual personalities and abilities into consideration, has a master plan and knows what it takes to achieve the desired outcome, and He absolutely demonstrates strength and commands respect without demeaning anyone. He loves us all the same but created each of us differently, with a different purpose to fulfill both separately and together. If we listen carefully and do what He says, every member of our team will be both fruitful and joyful, and the team will most definitely be victorious. Football season is upon us. My husband is a huge Notre Dame fan, so much so that a win or loss often dictates his mood on football Saturdays (and, from time to time, post-football Sundays). I'm a Michigan grad and my veins course with Maize & Blue blood. I'm also a yeller. I yell at the other team when they make me mad, I yell at my team when they're being stupid, I yell with glee when good things happen, and I yell at the coach when I could've done a better job. It might be the Hungarian temper, I'm not sure. It might just be that I'm so worked up I can't contain myself. Either way, it's hard to do any theatre during football season because sometimes I won't have a voice for the rest of the week. There's nothing wrong with getting worked up over something when it's in the right spirit. I used to go to a very conservative church growing up. We didn't even applaud. Someone would give a heartfelt rendition of a beautiful song and when it was done, in the place where applause would normally be, there was a half-hearted scattering of 'amen's throughout the congregation. I never understood that... and after reading the bible several times, I still don't. Psalm 100: "Make a joyful noise unto the Lord, all the Earth..."
Psalm 47: "Clap your hands, all people! Shout to God with loud songs of joy!" It seems that, in this stadium of life, God is appreciative of our loud praise and our outbursts on His behalf, regardless of their volume or their shape. And why shouldn't we get fired up for Him the way we do for football? God's team is always going to win. 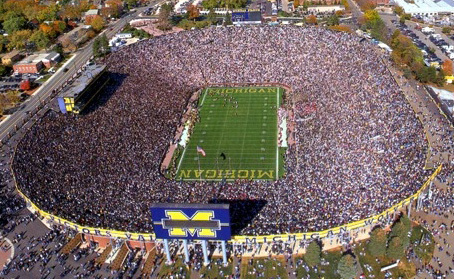 It might not look like it sometimes to our untrained eye, or to our faithless or fickle fan's heart... but, in the end? It's going to be what looks like a come-from-behind victory to smash every winning record ever held. Stay tuned for more fun foot-blogs to come! I'm on the sidelines cheering for you... just be sure you're listening to the Coach from the right team! Three years ago, my husband and I took a trip to Italy for his 40th birthday. Traveling the hills of Tuscany, I looked out the window of the bus and saw what could quite possibly have been thousands of olive trees. The grass around them wasn't particularly lush, their leaves were a greyish-green that didn't really stand out, and their trunks were mostly twisted instead of the strong, thick trunks of trees back home that I was used to. Still, I couldn't take my eyes off of them. They were spectacular because of their simplicity and seeing so many together really made an impact. If you look at this lone green olive tree, you'll notice a few things. Upon more than just a perfunctory glance, this tree appears as though it could be two trees wrapped around each other, but it's not. Growing from the same roots, two pieces of trunk crawl up and around, almost in an embrace, then branch out at the top to go in different directions and produce leaves and fruit which, in turn, will produce an astounding crop, rich bottles of olive oil, and ever so much more. With just this one simple tree, the possibilities are myriad. 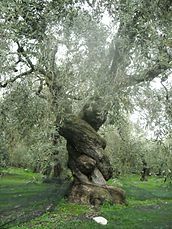 Olive trees can grow in almost any condition and can take a battering of weather, soil, and abuse, yet still thrive to bring one forth one of the most basic staples of diet in many places. Immediately after the biblical account of the flood, the sign that was brought forth to Noah that the land was ready? A dove carrying an olive leaf. A historic symbol of peace and victory? The olive branch. The most famous sermon in all of history? Given on the Mount of Olives. Formerly just titled after this blog, my main ministry partner, Andie Kingsbury, and I decided upon Green Olive Ministries as the name for our hands-on work together locally. She and her large family have been trusting God to provide a new home that would fit all of them comfortably, be in the right place for them to minister to the community, and to bring the financial aspects together while they are both unemployed. God being the miracle-worker He is did exactly that, and they are now in a home three times the size of what they'd been occupying until now. They are in a prime location to live missionally in their neighborhood and beyond, and I couldn't be more excited about the way God is working in their lives. On this end, after leaving my former place of employment because I'd felt so strongly that God was leading me to do so (though it made ZERO sense financially because we had also recently made the decision that He was leading my husband to finally go to school full time)... He has done nothing but provide for and bless us at every single avenue. Door after door has opened, and every time we've needed income, it's been there -- from random refund checks from water softener companies, to finding $5 on the ground, to having someone randomly call and say, "You used to clean houses, do you still do that?" Like olive trees, our families are thriving in every environment, no matter what kind of weather, soil, or abuse we've taken, and we're coming together as the hands and feet of Jesus to produce good fruit right where we are, to branch out and provide sustainable living solutions for those in need around us, to feed hungry kids in the community, to teach new mothers to make cloth diapers for their little ones, to pray and to help and to love everyone we come in contact with, just like Jesus did and does today. If you would like to make a donation to Green Olive Ministries, please know a few things: we're not shoving Jesus down anyone's throat. We're helping people, as many as we can, right where they are. If they're a fan of Jesus, great. If not, great. We're not judging, condemning, forcing anything on anyone... we're just in this to do the next right thing at each step. That being said, if you're on board with a monetary donation, a donation of your time, a donation of your goods and services toward any of our upcoming projects, or if you just want to learn more about how you can be a part of something bigger than all of us, drop me a line at AJourneyofReinvention@Gmail.Com and I'll get back to you right away. My husband, who played the dynamic, compelling role of Jean Valjean. My husband, of whom I am so proud, words cannot express it. This show was an emotional rollercoaster. For those of you who do not know the story, it is possibly the most beautiful allegory EVER of what true Christianity looks like. Jean Valjean, a convict who stole a loaf of bread to feed his sister's starving family, spends nineteen years doing time for this crime and for trying to escape. When he is finally freed, he's treated despicably by everyone with whom he comes in contact because he has to show his prison papers for the rest of his life wherever he goes to find work. 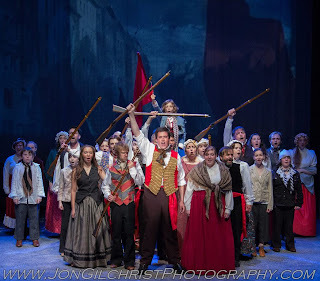 A kindly bishop takes him in and, thinking of himself first with no other option in sight, Valjean steals the silver from the table and runs, only to be brought back to the bishop by the police. Instead of condemning him as everyone else has, the bishop tells the police he gave these items to Valjean. When they leave, he shows Valjean another way of life -- the path that God has for his soul. Set against the backdrop of the French Revolution and interwoven with some other tales of love and misery, Valjean turns his life around and truly learns what it means to love unconditionally, to put others above himself, to dedicate his life to the right path. It's everything we believe in, and everything we're striving towards here on the Journey. Tears were shed daily. Watching the audience be moved by the lyrics and the presentation was one thing, but really feeling it inside was another. At the beginning of the rehearsal process was my sister's two-week stint in the hospital where she almost died. Another cast member's engagement was broken off during this time. Another cast member's father-in-law was diagnosed with cancer, another cast member's uncle has a partner who was on his deathbed, another cast member tore his Achille's tendon and was unable to perform the last three shows, and much, much more. Together, we got through everything with flying colors, a tremendous amount of prayer, and a lot of love for one another. How can a group of 40+ people get so close? I'd love to say theatre is always that way, but it's not. So often, there are cliques and drama queens and backbiting and gossiping and general pain-in-the-rear divas. But this cast was different. Sometimes we cried with each other, sometimes we celebrated, and most often we just came together for a common cause: love. Our director dedicated this show to his wife whom he lost a few years back to cancer -- he had directed a high school version of it, and it was the last show of his that she saw, saying it was his best work yet. Keeping that in mind, and watching his passion for what we were creating together on stage, how could we help but be inspired? So often, people would ask my husband 'How does your voice hold out?' The answer was, it just does. When something is meant to be, it's meant to be... and it's beautiful. Though I'm in the midst of a million different things including A Journey of Reinvention's first official hands-on project, an ambitiously large local cloth diaper ministry (see the Facebook page for details!) I needed to take some time to quietly thank each and every person involved in making this show a success this summer. I've made some incredible friends that I know will last a lifetime and I truly believe that we all cross one another's path for a reason.